Mike Thomas talks about collecting vintage football cards, noting the major manufacturers, popular teams and players, and what collectors look for in a card. Mike can be contacted via his website, Vintage Football Card Gallery, which is a member of our Hall of Fame. I collected football cards when I was a kid, back in the late ’60s, early ’70s. Then I set them in the closet for about 15 to 20 years and picked them up again in 1989. A friend of mine had a drugstore and he sold some of the newer football cards. He’d drag some of them out and give me a couple of packs to open, and I started to be curious about what I had in my closet, so I dug them out. I started going to card shows and card shops, trying to fill in some of the sets that I had started 20 years earlier. I just went from there, and I’ve been collecting vintage cards ever since. When we were kids, we didn’t care what kind of condition cards were in. We threw them around and traded star cards for commons. Whatever we needed, we would trade for, and we didn’t pay much attention to value. In the 20 years that I took off, adults started getting more involved and that’s when the money came in. Adults were willing to pay more for their favorite stars and for cards that were in immaculate condition, so the condition and the prices of the cards became much more important. Young people still collect cards, but they’re much more sensitive than we used to be about the card value. They’ll rip open a pack of cards and immediately check the price guide to see what people are paying for what they pulled out of their packs. We never dreamed of such things when we were kids. We just collected our favorite players. Collectors Weekly: Do you also collect memorabilia? Thomas: No, just the cards, but there are definitely some people who do both. Collectors who have a favorite team or player might collect everything they can get their hands on for that team and player, whether it’s cards or jerseys or helmets. Collectors Weekly: Do you ever trade cards? Thomas: Actually I just worked out a trade today, maybe an hour ago. To diversify what I have for sale, I’m trading with another collector. So, yes, trading happens. Whether I’m trading or buying, the first thing I do is check to see if I have it already, then I look at the condition. I try to collect pretty high-quality cards. With some sets, it’s difficult to find the high-quality cards, so I’ll collect medium-grade cards, but usually I look for the high-grade stuff. Each of the third-party grading services has a set of grading standards that they publish. PSA (Professional Sports Authenticator), SGC (Sportscard Guaranty), and Beckett all have their own grading scale. They’re similar, but not exactly alike. If there’s not a grade, collectors look at the corners to see whether they’re sharp or fuzzy or bent. They’ll look to see whether it’s centered or if there are any marks on it—pen marks or marks from the printing presses. Some cards are out of focus, some have poor color. I don’t know if they ran out of ink in the printing press or if they got faded in the light someplace, but sometimes cards are faded. Collectors Weekly: Do you have a favorite team? Thomas: I grew up liking the Oakland Raiders because they had a player who grew up in my hometown. His name was Pete Banaszak. But after he stopped playing, I started liking the Green Bay Packers more because I grew up near Green Bay. It’s pretty common for people to collect what they grew up around. I think people just like to relive their youth a little bit, reminisce about really liking their teams and following them closely. Some kids had their heroes growing up, and usually those were the local players. People want to hang on to that in adulthood, so they go back and collect those same players and teams again. I’ve decided to limit myself to the 1960s cards. That’s when I started collecting. You can’t afford to collect everything if you don’t limit yourself, so I’ve narrowed it to that. Cowboys cards, Packers cards, and the Oakland Raiders were popular back then, and they’re actually still very popular now. 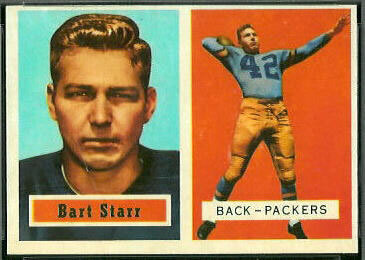 The Packers are probably the most popular team for vintage-card collectors. As for individual players, the most collectible are the Hall of Fame players, especially offensive players—quarterbacks and running backs—like Bart Starr, Johnny Unitas, Sammy Baugh, and Joe Namath. Collectors Weekly: When were the first football cards manufactured? Thomas: The earliest set was made in 1894. The set name was Mayo, but I don’t know how they were distributed. Baseball cards back then were distributed in packs of tobacco, but I don’t know if that’s the way these football cards were distributed. In 1935, there was a set that’s now popular called National Chicle. A few years later, in 1948, some of the major card companies like Bowman and Leaf finally got involved. 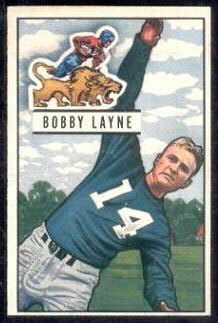 Before the 1950s, there were very few football cards produced. It was mostly baseball because baseball was simply more popular. Football didn’t get popular until the ’40s and ’50s. I’ll tell people that I buy and sell football cards, and they’ll say, “Oh, we didn’t even know they made them.” They’re familiar with baseball cards, but they’re not familiar at all with football, basketball, or hockey cards. There are twice as many baseball cards out there. Collectors Weekly: Who manufactured the vintage football cards? Thomas: Back in the ’40s and ’50s it was Leaf, Bowman, and Topps. In the ’60s it was Fleer, Topps, Philadelphia, plus a few minor ones. Kellogg’s put cards in its cereal boxes. I don’t pay any attention to modern cards, so I don’t know who’s out there now. Topps was the biggest manufacturer. They’ve been around forever. I think they actually bought some of the other companies along the way. Typically I think companies had the rights to one league or another, so only one company would produce the cards for the league for that year. That’s not true exclusively because both Fleer and Topps produced cards of the same players in 1961, but in most years it was one card company per league. Collectors Weekly: How hard is it to complete a whole set? Thomas: It varies greatly from set to set. Some are actually pretty easy and you can go on eBay and buy the whole set. Others are more difficult. Some cards are hard to find at all in any condition. I have the most trouble with some of the regional sets. There’s a Miami Dolphins set from 1967 called the Royal Castle that was only distributed in Miami. There weren’t that many of them printed, so just finding a card is difficult. There were anywhere from 10 or 12 to 500 cards in a set. The further back you go, the smaller the sets are. I think the manufacturers decided who they wanted in the set. They didn’t include some players because they wouldn’t agree to the contracts, but for the most part, I think they just printed cards of the players they wanted. Collectors Weekly: Can you think of any players who didn’t want to be part of a set? Thomas: I’m almost positive Paul Hornung wasn’t part of the 1958 Topps set. It seems to me that there was some sort of contract problem. Not every set has every player. Typically they have the better-known players, like the top-10 players from the team, and often they’re the offensive players—the quarterback and the running backs and the receivers. The people who played the offensive and defensive line didn’t often have cards printed of them. The manufacturers wanted the kids to buy the cards, and the kids knew the stars better than they did the other players. Collectors Weekly: Where did kids typically collect cards? Thomas: Most were sold with bubblegum for a penny or a nickel a pack—the cards were in the package. Sometimes the gum wasn’t the main thing the kids were after so the cards would get the kids to buy it. They also came free with various products. In the early ’70s, Kellogg’s put the cards in cereal boxes, and McDonald’s has given out cards. Back in 1961, the Lake To Lake Dairy in Wisconsin distributed Green Bay Packers cards with some of its dairy products. Some lunch-meat companies included cards in their packages, too. I imagine they put cards in their products so when the kids hit the stores with their mom, they would want the special lunch meat with the football card in it rather than whatever the mom would normally buy. Collectors Weekly: What are some of the rarest cards you’ve seen? Thomas: The regional sets, like the Royal Castle Dolphins from 1967 that I was talking about, generally seem to be the most difficult ones to find. 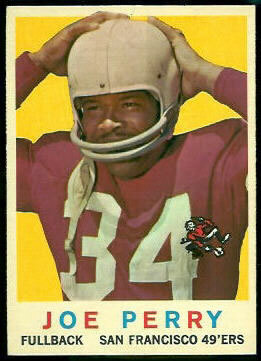 There was a San Diego Chargers set in 1961 called Golden Tulip—those cards are hard to find, too. In 1959 and 1960 there was a potato chip company called Bell Brand that produced Los Angeles Rams cards and put them in potato chips. Those cards are really hard to find. Collectors Weekly: What about college football cards? Thomas: There aren’t too many cards produced with college players on them. I think it’s a problem with licensing. As I understand it, they would have to get licenses with each individual college in order to print cards of college players. It’s much easier to print cards of the pro football teams. The pro players are probably better known, too, so they were easier to sell. That said, there are a couple of college sets. One is the 1955 Topps all-American set. It’s exclusively college players and very popular. There was another all-college-player set printed in 1961 called New Cards. That set’s not very popular because it doesn’t have a lot of famous players in it, whereas the 1955 Topps set has a lot of famous players that went on to have good careers in the pros, like Jim Thorpe, Sammy Baugh, the Four Horsemen of Notre Dame, John Lujack, and Don Hutson, who’s in the 1955 set. Some people say he was the best receiver of all time. Collectors Weekly: Do you have a collecting method or process? Thomas: Some people will collect one set at a time until they have it all. Typically I have 10 or 20 sets that I’m collecting at once, and I just add to them or upgrade cards that aren’t in very good shape whenever I happen to find one that I need. By collecting a few sets at a time, you can save some money. If you’re focused on one set, then you tend to pay whatever it takes to get the last few cards. But if you’re diverse in what you collect, then you buy whatever becomes available rather than focusing on one thing and paying a lot for it. Collectors Weekly: Besides a photo, what’s on a card? Thomas: It was pretty standard to put a player’s lifetime stats on the back of the card. For those who had played for a long time, statistics could fill up the entire back of the card—there wouldn’t be room for anything else. A lot of the cards have cartoons on the back or little facts about the players. Many players back then had jobs in the off season because they didn’t get paid enough to make a living at football. They’d sell insurance or whatever, so a lot of the little cartoons would say what the players did in the off season. One thing that I find really interesting is that they didn’t take new photos of the players every year. A lot of times they would use old pictures, so you’ll see the same picture four years in a row for the same player. I guess that was just a money-saving strategy. There are also lots of error cards, from simple misspellings to using the wrong player’s picture. I have a page on one of my websites that shows some of these. In fact, some people collect error cards. It’s kind of cool. Some cards will have the wrong back on them because after they printed the front of the card they’d somehow put the sheet into the printing press backward, so they’d get the wrong players on the wrong cards. There are also blank-backed cards. Collectors Weekly: Do you know which player had the most cards made? Thomas: That’d probably be one of the quarterbacks, like Johnny Unitas. Nowadays with all the different card companies, there might be 10 or 12 cards with a single player printed every year. 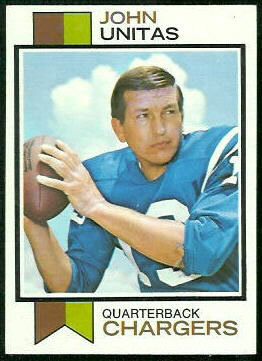 Back then it was one or two per year and the famous quarterbacks would probably be the players with the most cards. Collectors Weekly: Are there shows for card collectors? Thomas: Yes. I don’t go much anymore because there aren’t too many where I live. In the late ’80s, early ’90s, when I was beginning to collect, there were lots of shows. Now a lot of people buy online, so the shows aren’t as popular. They aren’t as necessary for finding the cards that you want. Thomas: Start slow and collect what you like. Some people get too concerned about value right away. There’s no guarantee that cards will hold their value, so it’s best just to collect what you like and not go overboard. Otherwise you can end up collecting a bunch of stuff that you ultimately aren’t interested in. If you start slow, you can learn more about how to grade cards and what they’re worth, as well as what you really want to collect. The initial temptation is to collect everything, but there’s so much stuff out there that you can’t possibly collect everything. When I started collecting as an adult in 1989, I was grabbing all sorts of junk—baseball and hockey and basketball, new stuff, old stuff. I quickly discovered that I had to narrow my focus a little bit. Collectors Weekly: What references or clubs would you recommend? Thomas: Beckett puts out a price guide every year, and they also have monthly magazines. There are some publications by Krause Publications, Sports Collectors Digest, and Tuff Stuff. I think they might have books as well, but nothing like Beckett. Beckett would be the most well-known publisher. Then there are lots of little groups online. Most of the online groups seem to be collecting modern cards, but there are some who collect vintage. I get the sense that there are lots more young people collecting today, and the young people are more interested in the current players than the old ones. Collectors Weekly: Do you display your cards or do you keep them in albums? Thomas: I don’t have any on display. I have most of my valuable cards in safe-deposit boxes, which seems goofy—spending a lot of money on expensive cards and then tucking them away in a bank someplace. That’s one nice thing about collecting lower-grade cards—you don’t have to worry so much about protecting them. You can put them in albums and bring them out anytime you want and look at them. If you get into the serious stuff, then you have to buy safe deposit boxes and insurance and all that. Collectors Weekly: Is there anything else you’d like to talk about? Thomas: Nothing really comes to mind. There’s nothing really complicated about the hobby. It’s pretty simple. People get overworked about some things, but I guess that’s what passion brings. People tend to forget that it’s just a hobby and it’s supposed to be fun. Think about what I’m doing, collecting the same stupid stuff I did when I was 10. It’s amazing, really. Hi, I had a question regarding a sealed set I found today at a garage sale. It might not be worth anything but I thought I would write you and maybe you’ll be able to tell me. On the front of the box it states on the right hand side and follows down with the following: Playoff, the NFL emblem, 1997 football cards, featuring Pro Football’s hottest players along with this season’s star rookies. Underneath it states Special Edition Collector’s set. On the inch side of the bottom it says, the complete 250 card set, 3 rare cards randomly selected from insert sets, 15 collectible chip shots, plus 1 super bowl XXXII commemorative card. I don’t even know who the makers of the cards are because it is sealed. Are you familiar with this box???? Any help you might be able to give me would be greatly appreciated. Thank you very much. When I think about the day I came home from my first day of high school to find that my mother had trashed my old beat up suit cases and boxes of baseball and football cards.She maintained that I was too old now that I was in high school for such “childish things” as sports cards. Wow,is all I can say right now!! !That was 1963. Wow ! I was wondering if this is worth anything. I bought it from a friend back in 1998 and forgot about it till 6 months ago. Description – On the front of the box it states on the right hand side and follows down with the following: Playoff, the NFL emblem, 1997 football cards, featuring Pro Football’s hottest players along with this season’s star rookies. Underneath it states Special Edition Collector’s set. On the inch side of the bottom it says, the complete 250 card set, 3 rare cards randomly selected from insert sets, 15 collectible chip shots, plus 1 super bowl XXXII commemorative card. I don’t even know who the makers of the cards are because it is sealed. Are you familiar with this box???? Any help you might be able to give me would be greatly appreciated. Thank you very much. Or maybe you can send me to a sight that has this information. I have a Metal Universe, Skybox International 1998 Jim Harbaugh/Baltimore Ravens quarterback card but he is wearing an Indianapolis Colts uniform. Fake, good, something special? Your help would be greatly appreciated as I have no idea where to look. Thank you! “ ” VHS is closer to the old drive-in or grindhouse theater, the way the director intended it to look.